After eight years with CWD, Kenneth Vinther has taken a leap of faith. The well-connected, experienced salesman and horseman started 2011 by launching a new distribution company, Innordic USA. No longer dealing in leather, Kenneth is now supplementing the horse world with products that are already taking Europe by storm. One of the revolutionary supplements is a natural energy product, Kompeet. Kenneth has already seen impressive results in a variety of horses in several disciplines since he recently introduced Kompeet here in the United States. Knowing the proof is in the documented changes, he shared some of these success stories. With notable excitement in his voice, Kenneth further explained the reasons he chose this new route. EqSol: So how did this career change come about? KV: My good friend and old trainer Johnny Hansen has all of his horses on Kompeet and he put me in touch with the company. I’ve been talking with them since last summer and it evolved from there. 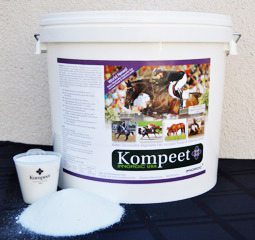 KV: The one product that inspired me is this new nutritional product for horses, Kompeet. The way it works is very interesting. It is an energy supplement that is derived from fat, not sugar. I’ll explain. A horse’s digestive system can only physically breakdown so much fat, due to acids in the stomach. Horses are foraging animals, built to eat grass in a pasture all day. Due to this they have a naturally slow digestive system. Most injuries and stress in horses are due to lactic acid, lack of strength which all goes back to a lack of sufficient energy in their diet. A European engineer developed a way to blend four types of digestive fat into a water-soluble vegetable fat. This provides a pure source of fat for both energy and weight gain. The key is due to the water solubility the horse will get 100% benefit. This is a huge benefit for high performance horses as well as hard to keep horses. This type of energy is called cold energy and it doesn’t have the highs and lows of energy derived from sugar. EqSol: Don’t high-energy feeds provide this source of fat? Or what about other supplements? KV: That’s just it – they don’t. It is not in any high-energy feeds. Yes the feeds have fat but it isn’t water-soluble. That is the simple but important key to how it works. Kompeet can easily be combined with other supplements. It is 100% pure vegetable fat, derived to increase energy; it has no added vitamins & minerals. 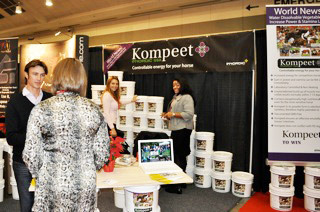 There is no competing product available on the market that can do what Kompeet does for horses. EqSol: You have testimonials. Tell us about these stories. KV: Besides the great results from Europe, I’ve tried the product with several horses here. All different horses, different levels and different experience – all saw results in a month. I tested it on a 17 y.o., 17h Holsteiner dressage horse. He required a ton of feed just to keep his energy up, especially when he was competing. Another test was with a warmblood mare competing in the 1.50m division. They had tried everything to keep weight and muscle on this mare without success. And the third was a young warmblood that also wouldn’t keep weight on and was low energy, lethargic. From day one these three horses all had the highest amount recommended of 14 ounces per day. You can feed less but more than 14 ounces has no higher effect. After two to four weeks the results were phenomenal. ALL the horses improved. They look and feel great. The dressage horse is doing better than ever, plus his feed has been reduced by 1/3. The mare is not only more buff, with increased weight and muscle but she is less marish and more energetic about her job. And the young horse developed more muscles and his performance improved dramatically at the shows there after. These results stem directly from the right amount of energy and balance in the muscle. Pure energy. EqSol: And that is just on those few cases. Do you see more potential? KV: The potential is incredible, from the retired horse that needs to keep weight on to the high-level performance horses in all disciplines. It acts fast. You can control the amount you feed. For example you can maintain and then during a competition you can bump it up. There are no side effects or negative aspects. EqSol: How do you find out more and where can you purchase? KV: It will be available through my company, Innordic USA; I am the only US distributor. I’m now working on having it more readily available through some exclusive retailers as well as through veterinarians. 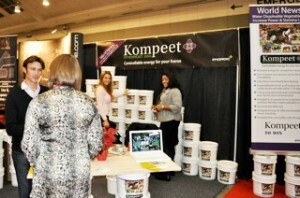 For example Kompeet is now available at Beval’s at WEF and Rolling Meadows in Thermal. I also had a booth at AAEP (American Association of Equine Practitioners). The response from the veterinarians was huge; a light went on they saw the potential right away. Other innovative products coming to the United States through Innordic USA include organic products for hooves, an Omega 3 Fish Oil as well as an organic treatment for riding arenas which eliminates the need of watering for up to 15 months. All products are scientifically based and engineered for the Equestrian world. Thank you Kenneth for giving us the new supplement scoop. Congratulations on your business venture. Seems certain many will soon be seeking to Kompeet with Kenneth. The Cavalor brand is a comprehensive product line that addresses the diversity of nutritional requirements for the equine world. After 20 successful years in the European market, Cavalor decided to bring their winning grain formula to North America. Just over a year ago, the Belgium-based company made their scientifically designed feed, Cavalor Perfomix, available to the Canadian and US markets. 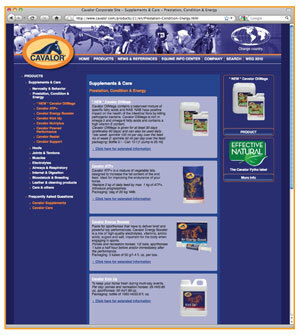 Since 1989, Cavalor has developed innovative ideas and approaches to equine nutrition. By combining true and applied scientific research with the experimental knowledge gained through field-testing, the result is a great product that makes a difference in the health of the horse. “There is no product on the market like Cavalor Perfomix,” Kristine Partin, Cavalor’s California Territory Manager, explained. “It takes a lot of education to create and market a quality product like this because feed goes far beyond what is printed on the label. Cavalor grain has been put into a form that is more soluble for the horses’ digestive systems and more absorbent.” When compared to other feed, Cavalor’s puffed cereal design allows the grain to stay in the horse’s stomach for a longer period of time, allowing enzymes more time to digest the nutrients. In addition to the digestibility of Cavalor feed being second to none, Partin wants to impart the importance of the grain’s stability, high vitamin levels and wholesome content. In Partin’s experience, International riders such as Jos Lansink, Eric Lamaze and Anky Van Grunsven, have fed Cavalor not only because of the grain’s content, but also because of the product’s high levels of quality control. The brand also stands apart from other grain and supplement brands because their entire line of products test cleanly during drug inspections at all levels of completion throughout the world. For more information on Cavalor feed, supplement and care products, please visit www.cavalor.com or contact Kristine Partin directly at (609) 672-0063. 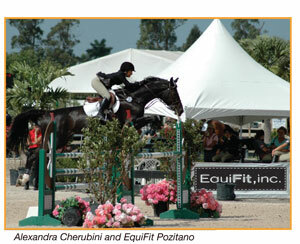 Alexandra Cherubini and EquiFit, inc.
We caught up with her this week, while she was at the Hampton Classic. 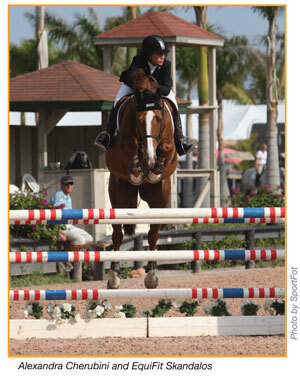 Always impressed with EquiFit, inc.’s approach, we asked her a few questions about the line. EQSOL: You have a wide range of products – all innovative. Can you tell us about the inspiration for some of these items? Life influencing product – how has your life experience played a role in the product line? AC: My family is in the medical supply and manufacturing business so I had grown up with various foams and materials around me. I had also witnessed the development of many products over the years. 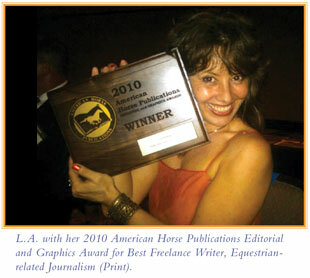 After college I worked in fashion PR in NYC and was determined to figure out a way to incorporate horses into my life. I noticed the lack of technologically advanced materials in the equine industry and decided to combine the two worlds; medical and equine. It seemed crazy to me that the equine athlete was not being catered to and that materials to help protect, support and encourage high performance were not being introduced to the market. 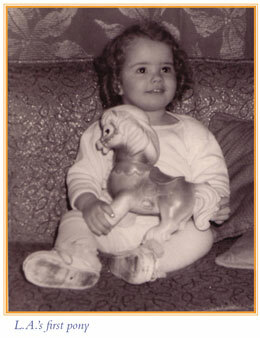 Our first product was Shouldersback, which bridged three worlds: Equine, Medical and Fashion. Our next endeavor was the T-Boot Series, which was a completely new product for the market, utilizing materials that had not been seen previously in protective boots. EQSOL: From concept to completion – can you talk about that process a bit with some of the innovative products you’ve developed? How do you keep up with the needs of your market, stay on top with all the brands out there and continue to create innovative products? AC: Research and development are a big part of my job and I love that aspect. I listen and observe A LOT. I try and find what horses and riders need. We also update our existing products on a regular basis, constantly making them better and expanding on our existing line. All of our products undergo rigorous testing by a large team of riders, managers, and grooms. If the product is not solely for the Equine market, we open up our ‘test’ group to a broader field. EQSOL: You are very active on the equestrian scene – tell us about your horse life. AC: I’m currently showing three show horses: EquiFit Pozitano and EquiFit Skandalos in the Jumpers, and Poker Face in the Hunters. My horse life is intrinsic within my professional life, allowing first-hand experience with all the products both on the market and in development. It’s a labor of love and I consider myself lucky! AC: EquiFit is all about creativity and thinking outside of the box, whether it be in product development, searching for new materials and pragmatic solutions or in marketing and educating the consumer. Because our products do utilize such different materials than anyone else, we HAVE to reach out and educate our customers on materials used and why they are different than current offerings. We do this through print advertising, web advertising, social media and a variety of other channels. We spend a lot of time on the ground at horse shows allowing us to gain direct customer feedback, see our product in use, work with our stores and educate riders, owners and managers about the benefits and features of our products. We feel strongly about supporting our team of riders, our customers, stores, and horse show partners. We have a great community. Thank you Alexandra – we look forward to seeing EquiFit, inc’s name and innovative solutions continue. We wish you the best on and off the horse! Alexandra Cherubini seems to have the Midas touch, both in her hands and her heart. The founder of ShouldersBack, a posture-enhancing garment designed by orthopedic specialists and EquiFit, inc. which integrates super absorbent t-foam into riding equipment, is a rare Renaissance woman. She has created product lines that transcend her primary equestrian market to include influence on fashion and sports apparel; she owns an art gallery with her husband and still finds time to be a competitive rider. Even while breaking into other industries, Cherubini remains true to her original equestrian passion and inspiration, and has both advanced and challenged the industry without losing sight of the traditions that shape it. The concepts for ShouldersBack and the EquiFit, inc. products resulted from a combination of Cherubini’s experience and her passion for the equestrian sport. Her first product, ShouldersBack, took on a life of its own, garnering the young entrepreneur a museum exhibit, several glossy features and a hands-on lesson in product marketing. According to Cherubini, “ShouldersBack is a wild ride! I was filling orders myself in Brooklyn when I got a call from the Met in New York.” The legendary museum included a ShouldersBack device in the 2001 exhibit “Extreme Beauty.” After that, it appeared in W Magazine, and reportedly gained some very high profile clientele. Cherubini took success by the reins. “I began to see different avenues for the product, from fashion and beauty to both chiropractic and speech therapy,” she says. It seems that opening the shoulders also releases the neck and the chest, beneficial for posture, pain relief and speech. Cherubini cites several contributing factors to her development of t-foam riding accessories, the staple of EquiFit, inc. “My family is in the medical industry so I grew up surrounded by t-foam, orthotics and heel lifts,” she explains. “And I’ve been drawn to horse boots, maybe due to my love for shoes.” She realized that t-foam was a perfect application for absorbing the impact that horses endure. The idea that she could access her assorted expertise to help horses was enough inspiration for Cherubini to start another business. Such advancements include the semi-controversial Tretorn riding boots. “It’s funny with these boots, people either love them or don’t, there is no middle ground,” Cherubini comments. And two new products that incorporate mineral oil and gel—a glide-on substance that protects riders’ legs and adhesive gel pads that guard horses against equipment rubs. EquiFit, inc. is also updating their boot liner for more durability and developing a liner exchange program so just liners, and not the entire boot, can be replaced after wear and tear. Cherubini has recently returned to the show ring and is thrilled. “I get to work in an arena that I love, and I guess I’m really lucky that way. It was such a blast to show again,” she beamed. A true industry mogul, Cherubini pays it forward by working with several relevant charities: the Equestrian Aid Foundation, which assists anyone in the equestrian world suffering from life-threatening illness, catastrophic accidents or injuries by providing direct financial support for their medical expenses or basic needs, and City to Saddle, a Boston-based charity that gives inner city kids an opportunity to ride. Combine knowledge with passion, mix in strong commitment, inspiration and some awesome energy and your end result is an industry innovator with a Midas Touch, Alexandra Cherubini. It is said that pound for pound, jockeys are physically the strongest athletes in the world. Former jockey Kathy Kusner is no exception, but her inner strength far exceeds her frame. In addition to being the first licensed female jockey in the United States, Kusner is a three time Olympian, ultra-marathoner, and a humble humanitarian. 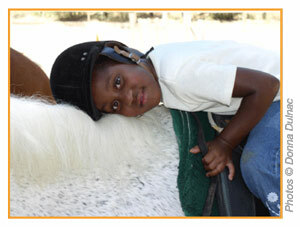 In 1999 she founded Horses in the Hood Los Angeles (HHLA), through which over 500 at-risk kids from the inner cities of Watts, Compton, and South Central Los Angeles have had the opportunity to attend 46 horseback riding camps. Their experiences with horses have literally changed their lives. Kusner grew up in segregated Arlington, VA where in her early career she served as a groom during a time when most of her colleagues were black men. “They were great riders and horsemen, but they could not participate in prominent horse shows. In fact, when we went to horse shows, I would go into restaurants with everyone’s order and we would eat outside because they couldn’t eat inside,” she recalled. Kusner, on the other hand, was able to participate in “colored” horse shows, which she describes as amazing events with beautiful horses and fantastic riders— and notable hospitality. “Everyone was so welcoming,” she said. In 1999 Kusner finally was able to get the first camp up and running. 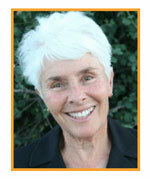 To spread the word she made personal contact with programs that dealt with kids at risk in Watts and Compton. One such program is Maryvale, a group home for girls who are wards of the state, girls who have suffered all kinds of physical and emotional abuse. Once a camp is set up at the participating stable — usually Mill Creek Stable in Topanga where, according to Kusner, they run a wonderful school with quiet and nurturing horses — kids are bussed from Watts to Topanga along the coastal Pacific Coast Highway. For many, it’s the first time out of their inner city environments and the first they have seen the ocean. On day one of the five day camp participants go from having never seen a horse, to learning how to groom, tack, mount, and position themselves on horseback. “It is amazing how quickly they learn!” Kusner said. “At the end of the day, many are posting and steering themselves.” Camp progresses over the five days with riding lessons in the morning and presentations from veterinarians, farriers, or trainers at lunchtime, providing an education in horsemanship. Campers then tack up again in the afternoon and demonstrate what they have learned. Within this short time frame, they learn to walk, trot, post, canter, steer and even go over cavalletti. In addition to the invaluable lessons learned on horseback, HHLA also provides each camper with a book called Happy Horsemanship and a disposable camera to capture the memories. On the final day of camp everyone celebrates with a pizza party, including parents organizing transport to the stable where they are able to watch their children ride, a concept that was previously unfathomable. It becomes blatantly clear after speaking to Kusner that for all her athletic abilities and accolades, her heart is even more exceptional. Want to help? 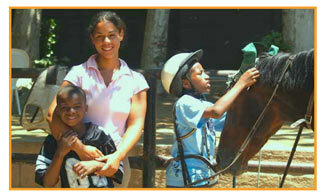 Horses in the Hood is currently looking for transportation, chaperones, and funds for camps. 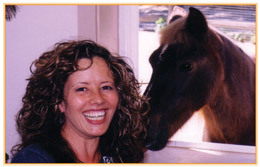 For more information, call 323-564-7669, or visit www.horsesinthehood.org. Tamara and Paul Petersen have an image of show jumping that many of us associated with the sport would wholeheartedly agree on – it is thrilling to watch and deserves the same outlets and consideration by the media as other extreme sports. With Showjumping Unplugged!TV, a half hour show that they film and host, these entrepreneurs chronicle the stories and exploits of the grand prix greats that are known to the horse world as mentors and inspirations and certainly deserve to be recognized and revered in sport circles. The Petersens have taken their work overseas to England, where they were received by the Queen herself and are heading back this summer to shoot a full-length documentary about the European Championships, a show that is more popular in England than Monty Python. “One of my favorite interviews was indeed with John Cleese,” says Tamara. “He’s funny, funny, funny, super charming, and so warm and giving of his time.” Cleese, whose daughter Camilla rides with Archie Cox, is one of the many interesting people that the Petersens have interviewed on the job. Meeting celebrities is a definite perk, says Tamara. After seven years covering show jumping, Tamara is a seasoned media pro. Showjumping Unplugged!TV has evolved, too, since its origins as a series of sponsor reels for grand prix riders. Today the show airs on KVMD in Los Angeles, on Del Mar TV every Monday and can be seen from any computer in the world at www.showjumpingunplugged.tv. Both Paul and Tammy shoot, host, edit, and produce the content. While the new FEI regulations could be fortuitous for the Petersens, their future plans are already in motion. On a royal note, the PR director of the Royal Windsor Horse Show invited Showjumping Unplugged to film the event in 2008. Their work was so well received, Tamara and Paul were presented to the Queen herself. “We had to have an etiquette lesson first,” Tamara recalls, “Since we hadn’t met her before, we had to address her as Your Majesty. She was honestly interested in what we did and we ended up talking about horses with her for several minutes.” Tamara reveals that she did make one etiquette error when she accidentally brushed the Queen’s arm during their visit. Social faux pas aside, the Royal Windsor shoot was such a success that the Petersens were invited back to cover the Olympia Indoor Christmas show in London. “It’s really an experience rather than just an event,” says Tamara. “They even call the classes ‘performances’.” It was there that they met with the Olympia Show Manager Simon Brooks Ward, who requested the pair to film at the upcoming Royal Windsor in May. They also recently got the green light for the documentary that they plan to film at the Windsor Castle European Championships, where they will follow Simon Brooks Ward and record the horse show visionary as he plans the momentous occasion. The documentary, which is to be titledSimon Sez: the Making of the European Championships, will be eligible for film festivals in 2010. While they prepare for their next trip to England, Tamara and Paul will hone their skills as the principals of Showjumping Unplugged!TV and continue to bring the thrill of the grand prix to viewers. “We want to be the vehicle that brings show jumping to the forefront of sports,” announces Tamara. From our own American royalty in the grand prix arena to the Royal Windsor Horse Show, the Petersens are bringing our sport to the TVs and computers of many a loyal fan worldwide. Have you ever wondered (or have you been around long enough to know) – who is Mary of Mary’s Tack & Feed? We were honored to have a chance to chat with Mike Mosley, owner of this well-established brand, to find out the answer to this and more. A well-known destination for So Cal equestrians in need of the finest, most current gear for horse and rider as well as a very visible sponsor of horse shows and advertiser in multiple publications, Mary’s Tack & Feed is conveniently located next to Showpark (the Del Mar Horse Park). Founded in 1963, the store established a clientele before the show grounds existed. Mosley and the rest of the staff at Mary’s are incredibly dedicated to their customers and take pride in providing the latest designs in tack and equipment, hard to find items, and high quality options. 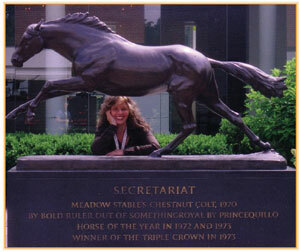 For each niche in the equine industry, Mary’s employs a specialized buyer so that the inventory is always up to date. “There are constant challenges involved in staying on top of the market, like keeping the variety so the inventory is interesting and satisfies the customer, whether the item is for a horse, for training a horse, just for riding, or just for fun,” says Mosley. “It is a monumental task for new employees to know as much as possible about the merchandise,” he adds. Thus, everyone on the floor regularly attends Mary’s University, a school within the tack store, so that they are able to answer any and every question about what is currently being offered. Mosley estimates that Mary’s stocks about three times as many products as a Home Depot, so a student of Mary’s University actually has quite a course load. So the answer to the question – Who is Mary? – is not just Mary Hammond but also Mike Mosley. His innovation plus Mary’s tradition create an excellent retail environment for equestrians.